LONDON (Reuters) – Next year is set to be one of the top-five warmest on record, British climate scientists said on Tuesday. The average global temperature for 2009 is expected to be more than 0.4 degrees celsius above the long-term average, despite the continued cooling of huge areas of the Pacific Ocean, a phenomenon known as La Nina. That would make it the warmest year since 2005, according to researchers at the Met Office, who say there is also a growing probability of record temperatures after next year. Currently the warmest year on record is 1998, which saw average temperatures of 14.52 degrees celsius – well above the 1961-1990 long-term average of 14 degrees celsius. Warm weather that year was strongly influenced by El Nino, an abnormal warming of surface ocean waters in the eastern tropical Pacific. Theories abound as to what triggers the mechanisms that cause an El Nino or La Nina event but scientists agree that they are playing an increasingly important role in global weather patterns. The strength of the prevailing trade winds that blow from east to west across the equatorial Pacific is thought to be an important factor. Professor Phil Jones, director of the climate research unit at the University of East Anglia, said global warming had not gone away despite the fact that 2009, like the year just gone, would not break records. “What matters is the underlying rate of warming,” he said. He noted the average temperature over 2001-2007 was 14.44 degrees celsius, 0.21 degrees celsius warmer than corresponding values for 1991-2000. Posted by honestclimate in Climate Models. The IPCC used the CO2 forcing of 3.71 W/m2. They multiply this by a feedback factor of 3.08, which boosts the total forcing due to CO2 to 11.4 W/m2. Monckton’s summary shows that 76% of this feedback factor is due to clouds and water vapour (with lapse rate change). But both of these feedbacks are the wrong sign! Roy Spencer shows that clouds cause a negative feedback, not positive, based on satellite data. He shows that modeler have interpreted cloud changes as a feedback, instead of a cause of temperature change. This reversal of cause and effect makes cloud seem like a positive feedback, when they actually cause a negative feedback. But more importantly, the IPCC assumes that water vapour causes the largest positive feedback, but the Hartcode simulation runs using the NOAA water humidity data shows that water vapour causes a large negative feedback. 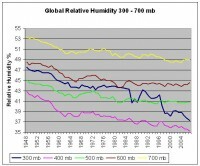 You have seen my graph of relative humidity before which is linked here. All climate models assume that relative humidity remains approximately constant with global warming. So if CO2 initially causes a small warming, this causes an increase in water content in the models, resulting is a large positive feedback But the data shows a 21% drop of relative humidity at about 9 km altitude, just where the predicted hot spot is missing, directly contradicting the models. The Hartcode simulation makes no assumptions of how the greenhouse effect works, or how much temperatures changes with optical depth changes. (Optical depth is related the surface radiation flux Su by Su = OLR(1+tau +exp(-tau))/2, where tau = optical depth). 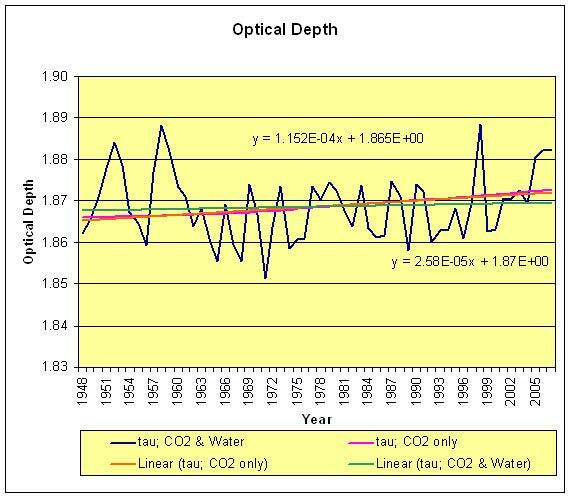 Here is a graph showing the optical depth changes over the last 60 years (water vapour and CO2), and the change due to CO2 only. Look at the pink curve, CO2 only. This is with water vapour held constant and CO2 only changing. The trend (orange line) shows an increase of 1.152 10-4 X 60 years = +0.0069, or about +0.37% in 60 years, confirming our belief the CO2 has a tiny direct effect on temperature. 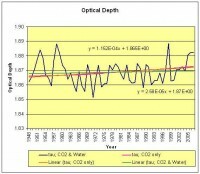 The blue curve shows the optical depth including CO2 and water vapour. Note that water vapour varies much more that CO2. But instead of causing a huge positive feedback, water caused a strong negative feedback, and reduced the optical depth trend (green line) to 2.58 10-5 X 60 years = + 0.0015, or about 0.083% in 60 years. This means that water vapour has offset 78% of the greenhouse effect of CO2 change over the last 60 years. This is very significant! Note also that there has been a dramatic drop in water vapour at all altitudes in 2008, which is not included in the above calculations. I do recognize that the early NOAA data might be less accurate than more recent data, but this is what the data shows. This data supports Miskowski’s theory of the greenhouse effect. Miskolcki shows the standard theory uses inappropriate boundary conditions. When real boundary conditions are used, he shows that the atmosphere maintains a saturated greenhouse effect, controlled by water vapor content. I encourage you to review this article, based on a draft by Dr. Noor van Andel. In summary, I think there are two main reasons climate models fail: 1. water vapour causes a negative feedback, not a large positive feedback, 2. clouds cause a negative feedback, not a positive feedback. See PDF here. “Based upon the statements of President–elect Barack Obama in support of the concept of man made global warming, the personnel he has nominated to head up agencies and offices involved in climate change, and the prominent role both the United Nations and former Vice-President Al Gore will play in climate change policy during the Obama administration, I must regrettably predict that such policies will result in the worst case scenario for Americans and many of the world’s citizens as the next climate change to a long and deep cold era advances toward us. It is now clear that the already forecast ill-effects of the next climate change will be magnified by the next US President’s administration resulting in the next extreme cold weather period becoming the most destructive possible. These effects will be manifested in terms of much greater suffering, loss of life, economic, social, and political turmoil, than would otherwise have to happen both in the United States and around the world. 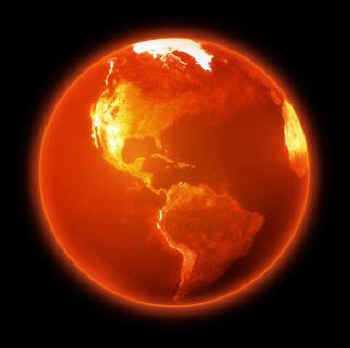 There is overwhelming evidence that Sun-caused warming of the Earth, notably over the past twenty years has now ended, that the Earth’s global temperature average is on a steep long term downward trend, and that the Sun has entered a phase of dramatically reduced activity, a “solar hibernation.” Unfortunately, it is also now apparent that the Obama administration that will take office late January 2009, will ignore the reality of our new climate and will instead quickly and easily pass its climate legislation through a Democrat party dominated Congress. New laws and regulations will mandate allegiance throughout the entire US government structure to an array of programs spawned to support the seriously flawed, and now discredited theory of man made global warming. 1. There will be a painful loss of precious time to prepare our country, its industries, our agricultural systems, our power systems and our people for the coming cold era. We will as a nation lose our few available years of preparation because of the Obama administration’s ill-fated diversion of the next four years and critical resources to combat something that no longer exists – global warming. In an effort to once again try to alert President-elect Obama to the situation, the SSRC sent another letter to him on December 11, 2008 with copies sent to his cabinet nominees. The same letter is being sent this week to US governors, leaders in Congress and members of the outgoing Bush administration. This letter is also posted for all to see at the SSRC web site. 2. The Obama administration in cooperation with a supportive main stream media, will reinforce and expand the already present persecution and ridicule of scientists and researchers who have opposed man made global warming concepts. An Obama government will begin a campaign to eliminate any debate and free speech on alternative theories to global warming and climate change in the course of which, restricting government grants to only those that will confirm mankind as the cause behind climate shifts. Punishment of dissenters will soon become institutionalized within the US government, causing removal from government service if not criminal classification for those who do not ‘sign on’ as believers in anthropogenic global warming as has already been recommended by United Nations climate officials. We should expect the Obama administration to follow what the UN recommends. As a direct result of this anticipated new government supported punitive environment, and its restrictions on freedom of speech, the SSRC today also announces it has released all its consulting scientists and researchers whose names have been previously published and will in the future not publicly disclose any who are on the staff of or otherwise associated with the SSRC. 3. The US will receive several hard to grasp agricultural shocks as the next climate change injects the first in a series of Spring post-planting time freezes and Autumn pre-harvest time ice and snow events. These events along with longer and colder record setting winters will start to occur now and well before the bottom of the next cold period expected around the year 2031. 4. Global warming advocates will try to explain away these anomalous weather disturbances as random events or other mankind caused occurrences. For example we should not be surprised to see any cold weather extremes to be reported as the result of reduced CO2 emissions from a lower industrial gas output caused by a recession. 5. The obvious unwillingness of the future President Barack Obama administration to discard the obsolete man made global warming theory and accept the reality of the next climate change will insure that as a nation, we will be unable to cope with the next climate change and its expected massive crop losses. These crop failures will doubtless cause the world’s worst subsistence crisis in recorded human history beginning after 2020 if not sooner, as well as collateral international economic and social disruption. The gravity of the situation cannot be overstated. Many people globally will certainly suffer or die unnecessarily as a direct result of the long term effects of the recently announced Obama Administration climate change initiatives. For the past two years, the SSRC and I have been leading the effort here in the US to help our government and our people become aware of and begin preparations for the record cold weather that is heading our way. First it’s Christmas lights, now it’s Christmas dinner…causing global warming. Yep. People who cook more than their guests will eat and throw the food away are destroying the planet. Wasted food at Christmas time is now being highlighted as an environmental problem. Jon Dee, the chairman of Do Something, says gases from leftover food rotting in landfill are 20 times more potent than the carbon pollution from car exhausts. Mr Dee says there are simple ways to avoid over-catering at Christmas and damaging the environment. “Australians waste more than 3 million tonnes of food every year and of course a lot of that food is wasted at Christmas,” he said. Okay, I’ll bite: if “gases from leftover food rotting in landfill are 20 times more potent than the carbon pollution from car exhausts,” why are we worried about carbon pollution from car exhausts? Or from coal-fired power plants? Now, add in all the methane being released from cows, bogs, and wetlands across the planet, and the fact that methane is a signficantly more powerful greenhouse gas than carbon dioxide, and hasn’t this article pointed out the extraordinary absurdity in the entire anthropogenic global warming myth? Global warming was blamed for everything from beasts gone wild to anorexic whales to the complete breakdown of human society this year — showing that no matter what it is and where it happens, scientists, explorers, politicians and those who track the Loch Ness Monster are comfortable scapegoating the weather. FOXNews.com takes a look back at 10 things that global warming allegedly caused — or will no doubt soon be responsible for — as reported in the news around the world in 2008. In April, media mogul Ted Turner told PBS’s Charlie Rose that global warming would make the world 8 degrees hotter in 30 or 40 years. “Civilization will have broken down. The few people left will be living in a failed state, like Somalia or Sudan, and living conditions will be intolerable,” he said. Ted Turner tells PBS host Charlie Rose that global warming will turn those who survive into cannibals. Crops won’t grow and “most of the people will have died and the rest of us will be cannibals,” Turner said. In February, Scotland’s Daily Mirror reported that 85-year-old American Robert Rines would be giving up his quest for Scotland’s most famous underwater denizen. In April, the Associated Press reported that global warming was going to hit beer drinkers in the wallet because the cost of barley would increase, driving up the price of a pint. Jim Salinger, a climate scientist at New Zealand’s National Institute of Water and Atmospheric Research, said Australia would be particularly hard hit as droughts caused a decline in malting barley production in parts of New Zealand and Australia. “It will mean either there will be pubs without beer or the cost of beer will go up,” Salinger said at a beer brewer’s convention, the AP reported. Giant Burmese pythons – big enough to eat alligators and deer in a single mouthful – will be capable of living in one-third of continental U.S. as global warming makes more of the country hospitable to the cold-blooded predators, according to an April report from USAToday.com. The U.S. Geological Survey and the Fish and Wildlife Service investigated the spread of “invasive snakes,” like the pythons, brought to the U.S. as pets. The Burmese pythons’ potential American habitat would expand by 2100, according to global warming models, the paper reported. THE Intergovernmental Panel on Climate Change model of dangerous, human-caused climate change has failed. Independent science relevant to supposed human-caused global warming is clear, and can be summarised in four briefpoints. First, global temperature warmed slightly in the late 20th century and has been cooling since 2002. Neither the warming nor the cooling were of unusual rate ormagnitude. Second, humans have an effect on local climate but, despite the expenditure of more than $US50 billion ($70 billion) looking for it since 1990, no globally summed human effect has ever been measured. Therefore, any human signal must lie buried in the variability of the natural climate system. Third, we live on a dynamic planet; change occurs in Earth’s geosphere, biosphere, atmosphere and oceans all the time and all over the world. No substantive evidence exists that modern rates of global environmental change (ice volume; sea level) lie outside historic natural bounds. Last, cutting carbon dioxide emissions, be it in Australia or worldwide, will likely result in no measurable change in future climate, because extra increments of atmospheric CO2 cause diminishing warming for each unit of increase; at most, a few tenths of a degree of extra warming would result from a completion of doubling of CO2 since pre-industrial times. These facts notwithstanding, the Rudd Government is poised to introduce a CO2 taxation bill on doubly spurious grounds. It presumes, first, that dangerous warming caused by human emissions is occurring, or will shortly occur. And, second, that cuts to emissions will prevent significant amounts of future warming. There is, therefore, now a dramatic disjunction between scientific reality and the stranglehold that global warming alarmism has on planned Australian climate policy. Today’s public views about climate change are based upon 20 years of promulgation of dangerous global warming by what has become a hugely powerful coalition of self-interested groups and agencies. Beneficiaries of warming alarmism include individual scientists, managers of research centres, morally pretentious environmental non-government organisations, prestigious science academies and societies, bureaucrats from government greenhouse and climate agencies, big businesses poised for carbon trading (think Enron and Lehman Brothers), alternative energy providers, those in the media who remorselessly promulgate environmental alarm stories, and, last but not least, those uninformed politicians who seek political advantage from cynical exploitation of the public’s fear of global warming. The Australian Government does not possess a national climate policy; instead, it has an imaginary global warming policy, based on sub-prime science, sub-prime economics and sub-prime politics. The Met Office is the UK Government’s official Meteorological agency and a key promoter of climate alarmism, which claims that simulation models are now accurate predictors of both global and local effects of stimuli to the climate. On August 31st, The Met announced that summer 2007 was the wettest on record with “normal temperatures,” although his description did not adequately describe the miserable summer – because high temperatures and sunshine were well below normal. In fact, global temperatures in 2007 dropped nearly 0.8 C according to satellite data, one of the sharpest drops on record. In order to hit The Met’s 2014 prediction, there will have to be a large increase over the next few years. On September 22nd The Guardian reported the Met Office claim that, “Anyone who thinks global warming has stopped has their head in the sand,” which referred to climate sceptic Nigel Lawson and attempted to play down the fact that there has been no global warming trend since 2002.